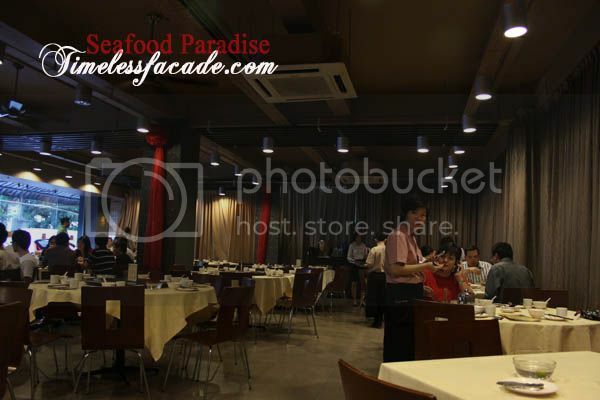 Yes, yet another visit to Seafood Paradise at Defu Lane, this time for a colleague's farewell dinner. The quality of food here has been rather consistent thus far, making it a reasonably priced and ideal option for financially tight folks like us. No change in the interior since my last visit a couple of months back. The air conditioned dining hall is still a hotbed for echos, which makes conversations pretty challenging unless you decide to raise your voice a little. 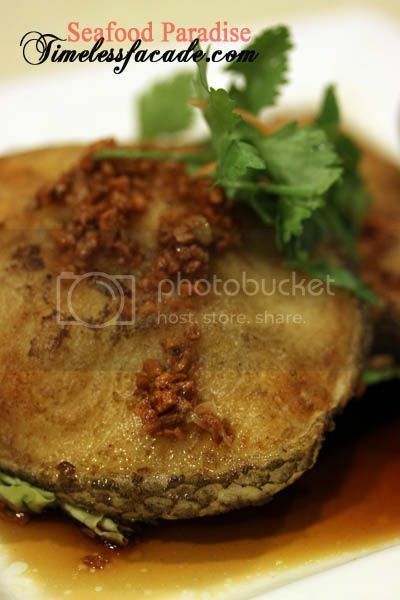 I thought this dish was quite decent - fried till crisp on the outside with a light touch of soy sauce that made eating it most enjoyable. A pity the flesh wasn't exactly sweet nor did it have the inherent oiliness and smoothness of cod fish. Which of course brings us to the question of whether the fish is truly cod. 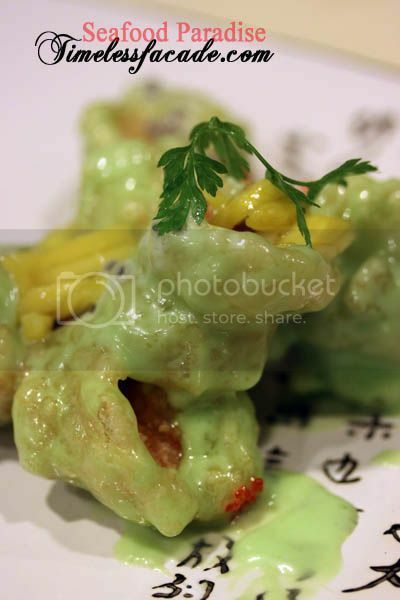 The wasabi prawns were a shocker, not necessarily in a good sense though. The average prawn size and portion size seemed to have shrunk by quite a fair bit since I last had this dish about a year and a half ago. However, to give it credit, the prawns were still nicely crisp with a hint of wasabi. They need to look into the sourish mango slices though. As a whole this dish was quite decent save for the scallops being sliced overly thin, which affected the texture. 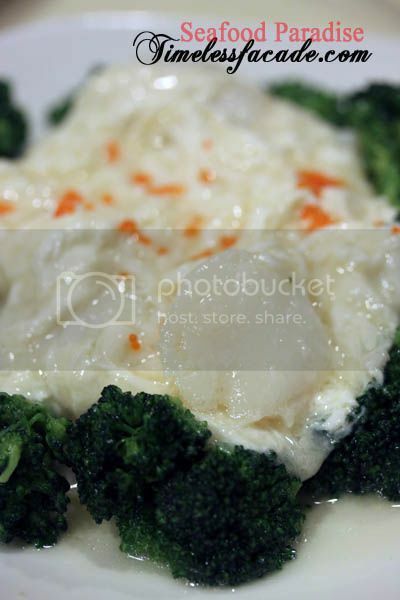 On the upside, the egg white wasn't too salty and coupled with broccoli, it made for a rather "healthy" dish. 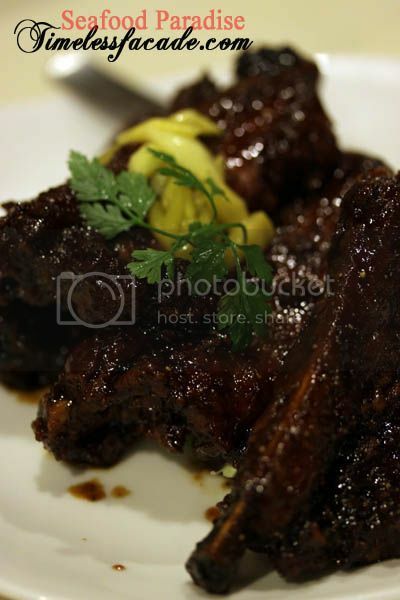 The ribs were tender but required some effort to dislodge the meat from the bone. The pepper taste was quite overpowering so if you can't take pepper, it would probably be advisable to stay away. At $3/rib, it was something different but I'm not sure it was worth that price. 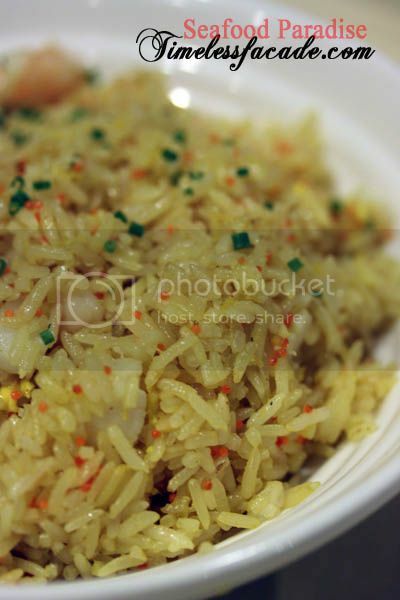 The fried rice was a burst of vivid colours, providing a visually enticing fullstop to our dinner. However, as with the prawns, portion size has been reduced quite significantly and a small serving now can only fill up 3 small bowls. Bits of roe and prawns made for enjoyable eating but the discernible lack of wok hei didn't really do it any favours. I am of the opinion that standards have dipped since my last visit and portion sizes have shrunk. Dinner for the 3 of us cost to the tune of $101 and we weren't exactly full at the end of it. In absolute terms, it certainly isn't expensive but factor in quality/quantity and I might think twice (maybe even thrice) about revisiting. 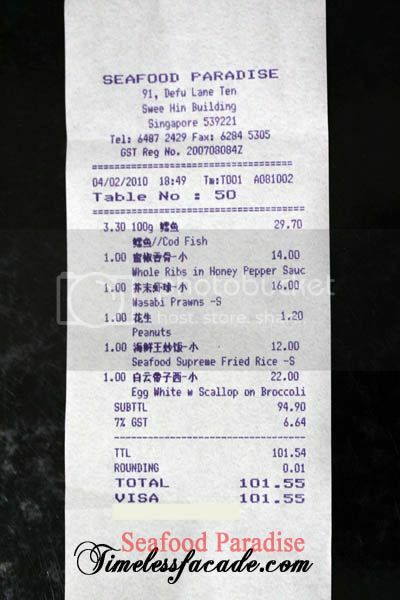 Has the Paradise group gone the way of many other restaurants - expansion at the cost of food quality?